Any nut butter can be used in place of peanut butter. The other nut butters have similar nutritional profiles. I used green tea. Enjoy! 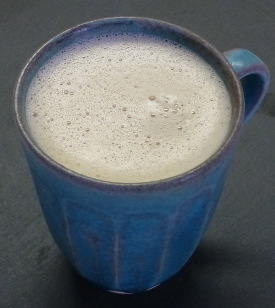 I’d love to know if you try this chocolate peanut butter elixir and how you liked it. Please leave a comment below. Happy Blending! Oh my gosh! This Is one wonderful smoothie! I made it with Teeccino’s Dandelion French Roast tea and it was absolutely wonderful. Just what I needed for my lunch break. I agree with your wonderful assessment :) Dandelion French Roast tea was a nice touch. Wow. This was awesome! It will be part of my daily routine :). Thanks for sharing all of these great receives. Awesome is good :) You’re welcome, Jen.